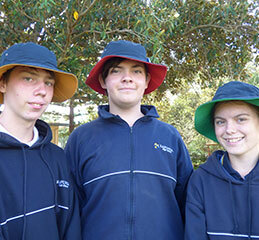 Kapunda High School has a strong tradition with students wearing our uniform in accordance with school uniform policy. A uniform committee comprising members of the Student Representative Council, Governing Council and staff periodically review uniform options. KHS reception staff are able to assist in this process, if required. The school has a full size range of all items to assist in fitting. Devon Clothing also provides a uniform fitting session at the school in Term 4 (details will appear in the newsletter and primary schools advised). Sun protective clothing is included in the school uniform/dress code and sports uniform. Students and staff are required to wear hats in terms 1, 3 and 4 whenever the UV level is 3 and above. Legionnaire, broadbrim or bucket hats are required when in the sun to protect the face, neck and ears. Hats can be any colour and may include logos providing they do not promote alcohol, drugs or make other illegal or inappropriate references. All students working in the outdoors are required to wear hats, sunscreen and sunglasses. Rash vests or t-shirts are required for outdoor swimming. To find out daily local sun protection times visit the SunSmart UV Alert: www.cancersa.org.au/sunsmart. Alternatively the free SunSmart App for Iphone and Androids is recommended and lets you know when you do and don't need sun protection making it easier to be smart about sun exposure all year. This information is also shared in our daily bulletin notices.